Gregory Valmont Thomas, a 14-season member of the Oregon Shakespeare Festival (OSF) acting company in Ashland, Oregon, passed away early on Monday, Dec. 18, in Ashland after a battle with cancer. OSF’s 2018 season will be dedicated to the man who worked under the name G. Valmont Thomas but was better known to his friends and colleagues as G. Val. G. Valmont Thomas as Falstaff in Henry IV, Part One. Photo by Jenny Graham, Oregon Shakespeare Festival. 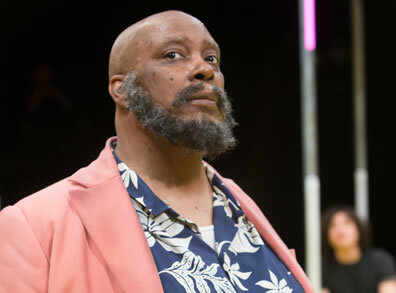 Besides being the only OSF actor to have played Sir John Falstaff in all three Shakespeare plays that feature that character, he displayed his versatility in the breadth of his roles in both classic and new work. Thomas performed approximately 60 roles in his 14 years at OSF. His first season at the Festival was in 1998, when he played Francis Flute in A Midsummer Night’s Dream and Snake in The School for Scandal. He remained a member of the OSF acting company every season through 2012, appearing in a wide range of roles including Simonides in Pericles (1999), Mistress Quickly in Henry IV, Part Two (1999), Feste in Twelfth Night (2000), Macbeth in Macbeth (2002), Boy Willie in The Piano Lesson (2003), Lincoln in Topdog/Underdog (2004), Falstaff in The Merry Wives of Windsor (2006), Solly Two Kings in Gem of the Ocean (2007), Gabriel in Fences (2008), Soothsayer in Antony and Cleopatra (2003), Melchior in On the Razzle (2007) and Blue in Party People (2012). He also served as assistant director of The African Company Presents Richard III (2011). In 2017, Thomas returned to the OSF company to play Falstaff in Henry IV, Parts One and Two. In October of this year, the Ashland Daily Tidings reported on Thomas’s stage IV prostate cancer battle and shared news of a crowd-funding campaign set up by friends that ultimately raised over $53,000 for his medical care. Thomas was slated to perform the role of Capulet in 2018’s Romeo and Juliet, and was to take part in his third Black Swan Lab, OSF’s primary play development incubator. Thomas also worked at A Contemporary Theatre in San Francisco and several Seattle theaters, where he won Gregory Awards for Outstanding Actor in a play (2013) and Outstanding Supporting Actor in a play (2016). He also served on the faculty of The Johnny Carson School of Theatre and Film at the University of Nebraska, Lincoln. Gregory Valmont Thomas was born Dec. 15, 1959, into an American military family inÂ Nuremburg, Germany. After a childhood of frequent military moves, Thomas spent his teenage years in Washington state. He received a bachelor’s in Theatre Arts from Western Washington University and an MFA in Directing for the Theatre from Pennsylvania State University. He is survived by his daughter Aria Thomas; son Langston Thomas; brother Raymon E. Thomas, sister-in-law Deborah and their child Blair; sister Bronwyn K. Thomas, her children Morgan and Zachary, brother-in-law Jay and two great nephews. Thomas was preceded in death by his parents, Henry R. Thomas Jr. and Kathryn C. Thomas (nee Hollingsworth).